We had a customer who needed help as she had a dilemma, being pressured into having a bouquet but the bride is not very keen on flowers. She’s not a girly girl even thou she would be wearing a traditional wedding dress, she felt that flowers where not for her. We have a large range of flower bouquets with matching items, but a wedding bouquet without any flowers are more unusual. 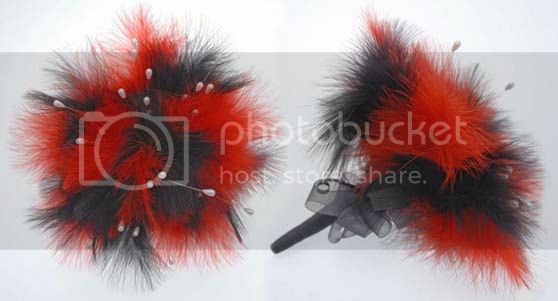 Option 1 for our bride to be, would be a feather bouquet, a bouquet made in just using coloured feathers. This bouquet is very bright and vibrant and shows the great colours that are available using feathers if this colour scheme is not your taste the feathers can be changed to match your colour choice. The feathers are available in white, light blue, light pink, red, black, yellow, lilac, purple, claret, light green, shocking pink, orange, ivory, and turquoise. 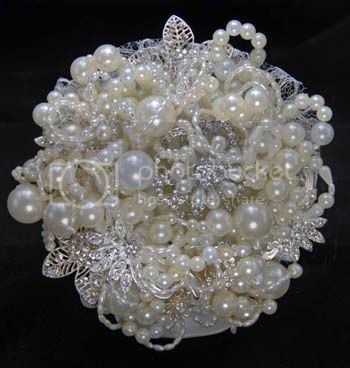 The bouquet also has drop pearls in it but these can be changed to crystals, loops of pearls, beads or any mix of these. The handle colour can also be changed to match your colour theme, with matching bows or pinned in to place with a diamante. Deciding which bouquet you would like would help us design a buttonhole and any other matching items you would need giving us ideas of the style and theme you like. Option 2, Another bouquet to look at is again made using feathers but with an added handmade pearl design to give it a real vintage style with ivory beads and pearls. The feathers give the bouquet a floating and slight movement where the beads draw your eye in to the middle of the bouquet to admire the detail. This bouquet has a very classic and vintage look. Option 3, The next bouquet is elegant and absolutely stunning, this bouquet is hand made with stylish beads, pearls and brooches. This bouquet has so much detail and different patterns in it, it makes it a real eye pleaser. The bouquet is a petite posy, but if you have a detailed dress it’s nice not to hide it behind a large bouquet, this bouquet may not be the largest brides bouquet but has great tones of personality and style. 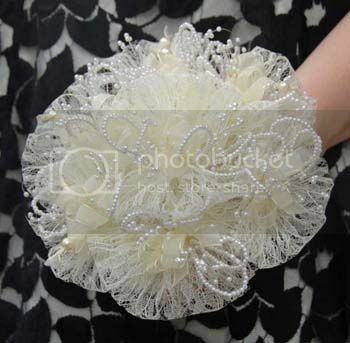 Option 4, The last bouquet choice is a bead, pearl and lace posy with a very vintage feel to it. The bouquet is a mixture of, ivory lace , ivory organza ribbon, with loops of solid pearls, branches of beads, loops of pearls and 9mm ivory organza bows with some having ivory beads on the end of the trails. Also because all our items are handmade we can create brand new items from your ideas, like picture you have seen in magazine or the Internet, we could also mix two or more items together to form a brand new bespoke bouquet just for you. 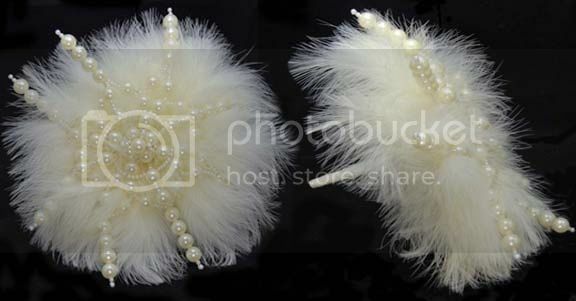 This entry was posted in Brides, Brooch Bouquets, Fashion, Wedding Themes and tagged artificial wedding flowers, beads, black, Bouquet, bouquet without flowers, Bride, Bridesmaids, Bridesmaids Posy, brooch, Brooch Bouquets, Brooches, claret, colours, crystals, diamantes, feather posy, feathers, ivory, light blue, light green, light pink, lilac, need help, no flowers used, orange, pearl bouquet, pearl posy, pearls, purple, red, sarahs flowers, sarahsflowers, shocking pink, silk flowers, turquoise, Wedding bouquet, wedding day flowers, Wedding flowers, white, yellow.